Foreword by Keith Ferrazzi, author of Never Eat Alone and Who's Got Your Back The first make-or-break step in persuading anyone to do any thing is getting them to hear you out. Whether the person is a harried colleague, a stressed-out client, or an insecure spouse, things will go from bad to worse if you can't break through emotional barricades. Drawing on his experience as a psychiatrist, business consultant, and coach, and backed by the latest scientific research, author Mark Goulston shares simple but powerful techniques readers can use to really get through to people-whether they're coworkers, friends, strangers, or enemies. 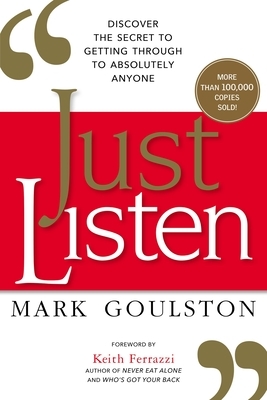 Just Listen reveals how to: * Make a powerful and positive first impression * Listen effectively * Make even a total stranger-a potential client, perhaps-feel "felt" * Talk an angry or aggressive person away from an instinctual, unproductive reaction and toward a more rational mindset * Achieve buy-in, the linchpin of all persuasion, negotiation, sales, and more Getting through is a fine art but a critical one. With the help of this groundbreaking book readers will be able to turn the "impossible" and "unreachable" people in their lives into allies, devoted customers, loyal colleagues, and lifetime friends. MARK GOULSTON is a business advisor, consultant, coach, speaker, and psychiatrist. The author of Get Out of Your Own Way and other popular books, he blogs for Harvard Business Review, Fast Company, Business Insider, The Huffington Post, and Psychology Today; co-hosts a weekly radio show; and is featured frequently in major media, including The Wall Street Journal, Fortune, Newsweek, Time, CNN, Fox News, and the TODAY show.